Amos E. Holt is, by his admission, “an old Texas cowboy” who is rarely spotted without his boots and hat. 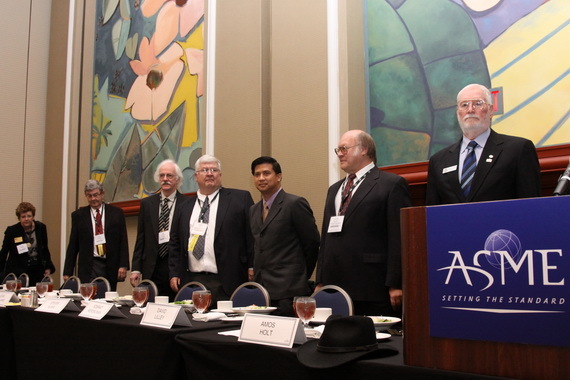 ASME President Amos E. Holt (far right), with his black hat at the ready, honoring recipients of engineering achievement awards. If you know Amos, you know he often quips about his roots. When he does, it’s always to make a salient point—and anyway, who would dare question the imposing Texan with the deep voice and black hat who wears the badge of ASME president on his chest. In his remarks during a luncheon yesterday commemorating outstanding achievements in engineering, Holt frequently quipped about the Cowboy inside of him. Some of his remarks left the audience smiling, but all of the remarks left them reflecting on the inspired wisdom of the man. “I’m just a Texas cowboy now in a global race,” he said of ASME’s ambitious strategic initiatives—which are in the areas of energy, engineering workforce development, and global impact, especially as it relates to international codes and standards and humanitarian aspirations. Like the cowboy that he is, Holt is a strong, tireless leader, always fighting for ASME and in strong pursuit of what’s best for engineers throughout the world. It’s a good thing this old cowboy is not quite ready to ride off in the sunset any time soon. Hey John – Great blog!